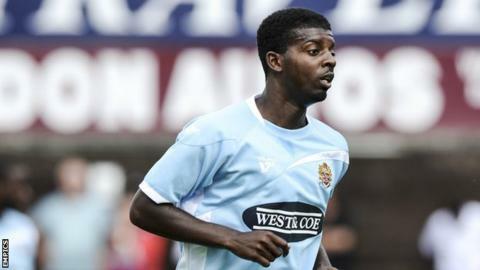 Torquay's hopes of remaining in the Football League took a huge blow after a defeat by Dagenham and Redbridge. Gulls defender Krystian Pearce put the ball in his own net in the first half, but it was quickly ruled out for a push by Luke Howell in the area. Daggers took the lead on 65 minutes through a Medy Elito penalty, after Dale Tonge fouled him in the box. Torquay go to Exeter on Monday knowing that anything other than a win will see them relegated from League Two. Match ends, Torquay United 0, Dagenham and Redbridge 1. Second Half ends, Torquay United 0, Dagenham and Redbridge 1. Chris Dickson (Dagenham and Redbridge) wins a free kick in the attacking half. Foul by Ben Harding (Torquay United). Attempt saved. Chris Dickson (Dagenham and Redbridge) right footed shot from the centre of the box is saved in the centre of the goal. Attempt missed. Chris Dickson (Dagenham and Redbridge) right footed shot from the centre of the box misses to the right. Attempt missed. Blair Turgott (Dagenham and Redbridge) right footed shot from the right side of the box misses to the right. Substitution, Dagenham and Redbridge. Chris Dickson replaces Luke Norris because of an injury. Attempt saved. Elliot Benyon (Torquay United) right footed shot from a difficult angle on the right is saved in the top centre of the goal. Substitution, Dagenham and Redbridge. Lawson D'Ath replaces Medy Elito. Anthony O'Connor (Torquay United) wins a free kick on the left wing. Foul by Luke Norris (Dagenham and Redbridge). Attempt blocked. Krystian Pearce (Torquay United) right footed shot from the centre of the box is blocked. Corner, Torquay United. Conceded by Femi Ilesanmi. Attempt missed. Luke Howell (Dagenham and Redbridge) right footed shot from the centre of the box is close, but misses to the left. Corner, Dagenham and Redbridge. Conceded by Ben Harding. Attempt missed. Elliot Benyon (Torquay United) right footed shot from a difficult angle on the right is close, but misses to the left. Attempt missed. Ashley Yeoman (Torquay United) header from the centre of the box is just a bit too high. Attempt saved. Baily Cargill (Torquay United) header from the centre of the box is saved in the top centre of the goal. Corner, Torquay United. Conceded by Abu Ogogo. Attempt missed. Shaquile Coulthirst (Torquay United) header from the centre of the box is just a bit too high. Ashley Yeoman (Torquay United) wins a free kick in the defensive half. Substitution, Torquay United. Jordan Chapell replaces Courtney Cameron. Substitution, Torquay United. Ashley Yeoman replaces Dale Tonge. Dale Tonge (Torquay United) wins a free kick on the right wing. Foul by Femi Ilesanmi (Dagenham and Redbridge). Substitution, Dagenham and Redbridge. Blair Turgott replaces Adebayo Azeez. Goal! Torquay United 0, Dagenham and Redbridge 1. Medy Elito (Dagenham and Redbridge) converts the penalty with a right footed shot to the bottom right corner. Penalty conceded by Dale Tonge (Torquay United) after a foul in the penalty area. Penalty Dagenham and Redbridge. Medy Elito draws a foul in the penalty area. Attempt missed. Krystian Pearce (Torquay United) header from the centre of the box is close, but misses to the right. Baily Cargill (Torquay United) wins a free kick in the defensive half. Attempt missed. Luke Norris (Dagenham and Redbridge) right footed shot from outside the box is high and wide to the right.